Time has been kind to the golfer. While there are still jobs for elite caddies on the pro tours, the club caddie has all but vanished from the fairways of North America. The first pro golfers rose from the ranks of early greenskeepers. Alan Robertson is often referred to as the first real professional. The first Open Championship, referred to in North America as "The British Open", was played 2 years after his death, or he may have been as well known as old Tom Morris, who was, in fact, Robertson's apprentice. The Open was really the only tournament that was played in those days and the idea of actually playing golf for a living was still a long way away. Fame, wealth and glory come to today's top golfers, but it was not always so. The pros made a meager wage by making clubs and balls for the well to do, running the shop and occasionally giving lessons or caddying. Sometimes they were able to line their pockets with a successful wager. Up to the late 1800's, the golf pro was still pretty much a servant of the club members. There was no such thing as a "Tour Pro ". Pros in those days were not allowed to enter the clubhouse. They were not treated badly, but certainly not invited to members' homes or parties. In short they had no social standing, and the line in the sand was drawn at the clubhouse door. Many pros hardly ever had an opportunity to play, or practice. Their days were mainly spent slaving away at the workbench, carving, shaping and sanding clubs. It was not until the turn of the 20th century that the stature of the professional golfer slowly began to grow. It first began in Europe, where golfers found themselves being treated with newfound respect and admiration. They were the masters. In England the class system was still firmly in place. Finally, player's accomplishments in events such as the Ryder Cup began to earn them some respect. In 1895 ten professional golfers and one amateur played in the first U.S. Open in Newport, RI. There was the Western Open in 1899, but this was not 'tour' golf. The events lacked continuity. In the US, at the turn of the century, visiting Englishmen and Scots were winning most of the golf tournaments. 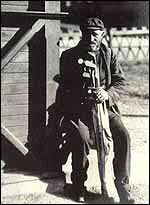 Then, in 1913 Emmett Scott, an American, won the US Open. Tournaments suddenly started springing up, and the "Tournament Player" was born. He was not socially cast in the same mould as the Club Pro. It was still virtually impossible to make a living playing golf. There were winnings to be sure, but purses were small, even in time adjusted dollars, and living on the road was costly. Many of the early tour pros would go from event to event, needing to make the cut, in order to get funds to finance their trip to the next venue. Travelling primarily by train or car, they were constantly on the road. There was no money in it, but there was great honor. They always had to supplement their incomes by giving lessons, or some such. At least the IRS never showed much interest in them. After World War II things really began to turn around. The American pros began to display the trappings of affluence, their wives adorned in furs and the best jewelry. Arnold Palmer, in 1958, led the PGA Tour by winning $42,000, a year in which the total prize money on tour was barely over one million dollars. Palmer and color TV came to golf at about the same time. And his swashbuckling go-for-broke style and his charisma came along just as television was discovering sports. Palmer and TV made a perfect marriage that pushed golf to unprecedented popularity. This exposure inspired millions to try the game and, at the same time, TV rights fees sent purses soaring. Corporate America began to take notice. Nicklaus, Snead and Palmer were giants. Golf was suddenly very glamorous. Film stars and entertainers such as Bob Hope became golfers and their endorsements heightened public awareness and drew crowds to the tournaments. The PGA tour prize money began to escalate as sponsors clamored to align themselves with the game. The PGA tour was now firmly established as the strongest field in the world, boasting enormous purses. The best golfers from all over the world were now getting rich in the US. The club pros also began to make a better living and with the growing popularity of the game the shops and golf schools started to produce a good living as well. Golf clubs, now mass-produced, are being "custom fitted" in high tech workshops. The club pro now has some time to hone his skills. In the 1980's the European tour began to enjoy some of the rewards offered in the US, but has never really caught up. The best of the best still play at least 15 tournaments a year in the States and are treated like kings. It is now a very comfortable life, for the good player. On the other side of the coin, however, for the player who struggles still has a time of it. If you don't make the cut, you don't get a cheque. Some players spend years on the tour barely making enough to get by. At least the possibility exists. Tiger Woods, who is just 22, won twice as much money last year -- $2 million -- than the entire purse for all the tournaments in 1958. And the total prize money for this year is $95 million, a figure that will nearly double over the next four years. Justin Leonard, at the ripe old age of 24, won $720,000 at the 1998 Player's Championship. 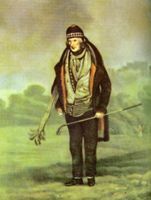 Caddie Willie 1838 Gentleman golfers of the 18th century often had many personal servants. It was only natural that an elite gentleman would have a servant tote his clubs and find his balls for him. A caddie. Many matches would also make use of a "forecaddie". The forecaddie was so-called because of their job as a "forward caddie", one who would be sent up ahead to sight the driven ball. The grazing of the sheep and rabbits was all that would cut the grass, so players tended to rely on the forecaddie at every hole. The players, to alert the forecaddies to spot the flight of the ball, yelled "Fore". The old time caddies were men from hard backgrounds whose nicknames occasionally suggested just how they had to be to survive. With feathery balls costing a week's wage and with the popularity of gambling among players, a crooked forecaddie who might also accept bribes from players, could supplement his wages handsomely. Willie Johnson, for instance, became known as "Trap Door," because he pretended one leg was shorter than the other was and had a special boot made with a hollow sole. In it, he hid "lost" golf balls, which he later sold back to his clients. His boot, it is claimed, could hold half a dozen golf balls. Most of these men lived hand-to-mouth. They also had a sense of craft that was handed down from father to son. That's what separated them from someone who just carried clubs. They employed knowledge of wind, ground, of how conditions affect what route to take. They quickly learned the way you hit the ball ... and they take you around the course like a guide instead of some sort of a packhorse. Eventually forecaddies were phased out, at least in everyday play, but the army of volunteers spotting balls at any professional event holds testimony to their continued use. I suppose that the luxury of a forecaddie is something that most of us will never experience. Unless one had the occasion to hit into the group ahead with a spectacularly long shot! Over the centuries the duties of the tour professional's caddie have evolved into that of the player's right hand. No longer a lowly servant, but rather an important part of the team, caddies can help a golfer in many ways. They're part of the fabric of the game. They help to set the overall game plan and the plan of attack to each hole. They are responsible for knowing the correct yardage for every lie on every hole and must know the greens and pin placements to help manage the golfer's game. A good caddie also gives psychological support, steadying the player whenever necessary. The pros have long-standing relationships with their caddies. Some players even seem to have difficulty performing without their regular "man on the bag". The only tour caddie most of us could easily identify is Mike "Fluff" Cowan, the aging hippie who carries Tiger Woods' bag. His six-figure income is something none of his predecessors dared dream about. Public golfers used to use caddies -- once. Over the years many junior golfers have earned their way onto fine courses by toting bags for members. Ben Hogan, Byron Nelson and Sam Snead, three of the finest golfers America has produced, all learned to play the game in caddie yards, with whatever balls and clubs they could find. The declining use of the caddie has hurt junior golf tremendously. For the most part, at least in North America, caddies employed for public play are now rare indeed. But one can still have the pleasure of a caddie's company at some more traditional private golf strongholds. Hamilton Golf and Country Club still sports an active caddie pool, boasting 141 young caddies, one of the largest caddie programs in North America. In Europe, golf cart usage is not as widespread, and at most courses in Scotland to this day, players get around a course in three hours with a caddie. And they don't rely on powered carts or lasers to do it. They rely on a good caddie. Since the mid-1950s the spread of the motorized golf cart has been popular with golfers and a financial boon for the courses. Golf courses are, after all, businesses and carts are a source of revenue. Carts are mandatory at many courses all over the U.S., and although that practice is not as common at courses in and around Ottawa, it is only a matter of time before that trend comes closer to home. The power cart has taken over, and has put the caddies out of work. Carts have quickly become the caddie's worst enemy. Caddies, and walking, aren't in the equation. By the mid-1970s the conversion was virtually complete. Even the cost of a cart rental is less expensive than hiring a caddie. Of course, the cart doesn't offer you what an experienced caddie can. However, Global Positioning Satellites are now being used to judge yardages on the golf course from your cart. I expect it is only a matter of time until wind speed, wind direction, and elevation changes could be monitored and factored into a cart's computer report. Who knows, perhaps even ground conditions could be assessed by the superintendent and included into the programming each day. To the golf clubs collective defense though, golfers don't like the idea of paying someone a fair wage to carry their bags, and most would only have a caddie as a once in a lifetime extravagance. It is difficult for clubs to train caddies, only to have them stand around until someone wants to hire one for a round. Most clubs that have held on to their bag toters now classify them as independent contractors rather than employees. Unfortunately for the club, that does not generate revenue for anyone but the caddie. As a way to preserve the tradition of caddies, some clubs have runners. Runners perform the same tasks as caddies, except they dont carry bags. A runner will go with a twosome or a foursome, who all ride in a cart. The runner will locate balls, replace divots, tend to greens, and estimate distances, while golfers can concentrate on other things. The mechanizing of caddie's services may be seen as progressive, but it's not a development we should necessarily cheer. However, there is an upside of the decline in caddie usage. It's a safe bet that no superintendent at a course with golf carts ever got a letter like the one written by a G. Leslie Smith in 1892. It complained about a caddie that apparently had a few too many "wee nips". "He could not tee the ball properly," the letter concluded, "and fell down." Golf has seen it all. It will see more. It is certainly one of the oldest games still played in the world, and it is unique among sports. The powers that be will resist change as much as possible, to preserve the traditions of the game and to ensure that it is never transformed into something unrecognizable. But in the end, change is inevitable. I don't pretend to know if that is good or bad, it just is. I do know one thing though, I am glad I don't have to play feathery balls with hickory shafted clubs on uncut fairways and on virtually unputtable greens. But I truly wonder what the old masters would think of today's game.